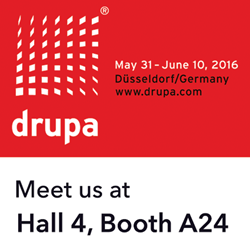 Michelman will introduce primer at drupa 2016 for use with high-speed water-based inkjet presses. The experimental primer is applied at coat weights less than a gram per square meter and enhances adhesion of print receptive coatings to synthetic substrates. This allows full color printing on presses running at 200 meters per minute (650 ft/min), while using standard synthetic substrates. Michelman, a global manufacturer of digital printing-press primers used in commercially printed material as well as labels and packaging will introduce drupa 2016 visitors to a new primer technology for use with high-speed water-based inkjet printing presses. 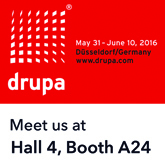 Michelman will exhibit in hall 4, booth #A24 at drupa 2016, which is being held May 31-June 10, 2016 in Dusseldorf, Germany. A number of inkjet printer manufacturers will be demonstrating Michelman solutions at the show, highlighting samples including flexible packaging, printed using water-based inkjet presses with various synthetic and polymer film substrates.